Stirling was an important port until the 20th century. For that reason, many seafaring men retired here and some left their working tools to the Stirling Smith like this beautiful compass used by Captain James Forrest. 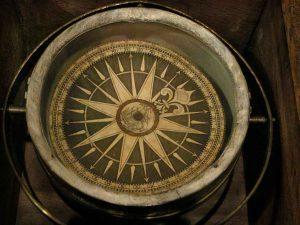 The compass is of French manufacture and is dated 1764. Forrest lived in the period 1740-1810 and married a Miss Hutton of Liverpool. 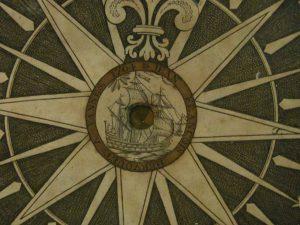 He sailed ships from Liverpool, Alloa and Glasgow, but the chief point about his life and this compass, in Black History Month, is that many of his ships were slave trading ships, taking human beings from Africa to the West Indies. In the wars between Britain and France, these ships were constantly fought over, and changed hands, adding to the misery of the human cargo on board. One of Captain Forrest’s sons, Dr. William Hutton Forrest (1799-1879) practised as a doctor in South Carolina, 1819-1823, probably on a slave plantation. Scottish doctors were valued for their ability to keep slaves healthy and able to work. He was later a well-known doctor in Stirling. Beautiful objects can often hide a dark history, and throughout October, such objects in the Smith Collection are specially labelled for Black History Month.